Interesting new play styles to enhance your gaming experience with TS3. Replies: 6 (Who? ), Viewed: 6837 times. #1 27th Nov 2015 at 11:40 PM Last edited by NonSequitorian : 2nd Dec 2015 at 7:33 AM. A challenge for the modern age, modeled after a simple monastic life. Life outside is bitter, and often cruel. You feel compassion stirring in your heart for all the trouble and despair in the world. In quiet contemplation, a higher power responds. “You are right. There is soul sickness in the world. Make a monastery, and bring the lost to me there.” Following this call of hope, you take your meager savings and create a refuge for the soul sick. Soul sickness really takes it out of your sims. The sickness is rampant, often contagious, and sometimes fatal. Every so often during the challenge, the higher power gently directs another sick sim to your sanctuary. Sometimes you lose someone to the sickness, but with care, patience, and understanding, the sick get better, and hope builds with each new day. This challenge takes place primarily on the home lot. Sims suffering or recovering from soul sickness must lead lives of quiet contemplation and monastic study. Exposure to their former worldly environment greatly increases the risk of further damage to their already overburdened souls. Healing soul sickness requires a nurturing environment. The challenge ends when your monastery has had no outbreaks of soul sickness for 14 sim days, or can obviously cure outbreaks within a few minutes. While you can expect this to take quite awhile, there are several paths to achieving the goal. The challenge fails if everyone in your monastery succumbs to soul sickness. While the ruleset seems long, once you set up your Monastery, all you have to know is how sims get Soul Sick and what can be done about it. The following mods were used to create this challenge. I haven't experienced any conflicts between/among these mods and they work for me, so it's up to you whether to add them to your game. NRAAS Overwatch and NRAAS Errortrap – these do essential general maintenance and keep the game running smoothly. NRAAS Saver – prompts to save the game every so often in case things do not go so smoothly. NRAAS Story Progression – replaces the default story progression and causes inactive townies to work, marry, and have children. Kinda spammy with all the announcements of every event in town, but totally worth it if you intend to play beyond six or eight sim weeks. NRAAS Master Controller – does pretty much everything that is normally accessed by “testingcheatsenabled true”. I used it to adjust family funds when the challenge calls for this, kill off sims, add townies to the household, etc. Anak_ponti's Buyable Vacation Objects Mod - Causes World Adventure items such as nectar makers to show up in the grocery store. Only works if you have World Adventures installed. It is also recommended that you turn the Seasons EP off if you have it. You will not need aliens or festivals, and winter/flu/allergies will SERIOUSLY hamper your monastery. The mod I use to selectively turn an EP on/off is called SimGameSelect by RaphaelNinja. You run this before you run your game and click it to turn on/off whatever you want, then launch your game. Then, if you want to turn EPs on/off later, you just click it again and run your game again. ETA:I see Origin just released a patch to allow selective EP. Since I'm already using the mod, I don't need this. But as I understand it, you can use this tool to play without Seasons. Okie dokey. If you intend to homeschool, load NRAAS Career and the School plug in for it. Select the child, click on the City Hall and choose “Enroll in Homeschool”. Now your child can download homework on the computer, plus turn it in when done. If you don't want to use this mod to homeschool the children, you should go into edit town and delete the school. Role-specific: one strip of paper for each role, depending on the expansions you use. 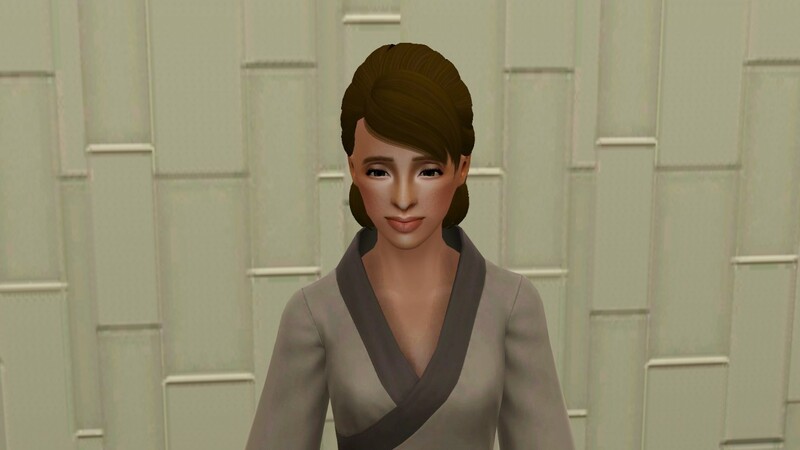 Sort these into unused roles (from which you draw when a new sim is added to the monastery) and roles-in-play (from which you draw for Trips and Random Outbreaks). You start out with four sims. Write each of the following roles on separate slips of paper and put them in a “hat”. As the game progresses, you will be adding or subtracting roles from the hat. We'll cover the descriptions and details of each role in more detail later. You'll be buying the equipment in a moment. Additional expansion-specific roles are unlocked through game play. The equipment for the unlockable roles includes: Bot Building Station, Board Breaker and Training Dummy, Nectar Maker, Gladiator Camera, Alchemy Station, Old Western Horse Stall. You start with four sims, none of whom are related. Randomly mix up the roles in your hat, and draw out four. These are your starting sims' roles. If your starting roles have no moneymaking ability, you still may play the challenge – it's doable. Be creative with it! 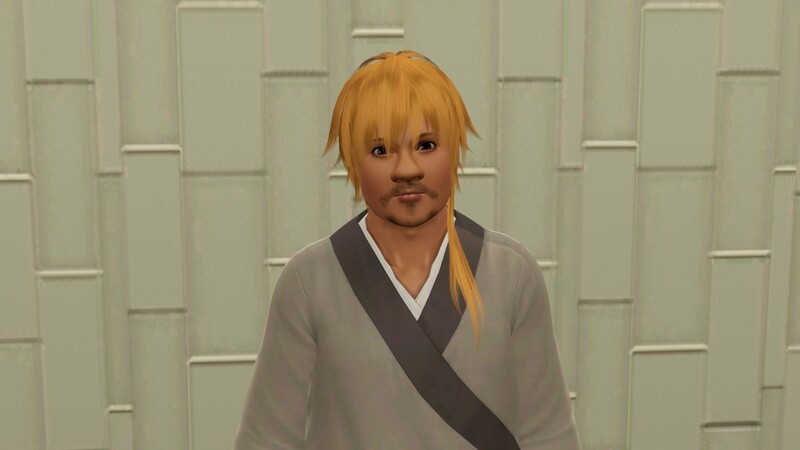 In CAS, you can make the sims look however you want, whatever age YA or older, and in whatever gender(s) you want. However, they must all be human. I put them in monk-like robes, but any plain, hard-wearing clothes will do. All created sims must have the Absent-minded and Neurotic traits. Give each of your four starting sims one of the following traits (one trait per sim, do not duplicate): brooding, clumsy, grumpy, hot-headed, inappropriate, insane, or over-emotional. You may choose whatever you want for the remaining trait slots. Disable Seasons entirely (see the Mods section for details). Set aging on, using normal ages (Inf=3, Tod=7, Ch=7, Tn=14, YA=21, A=21, E=17). Set celebrities off, and opt active household out of celebrity system. Set Full Moon to 6 days, with zombies. You can use cheats/mods to give them however much money they need to create the monastery. You may add walls/basements/stories and such for future use, but see below for the allowable starting furniture. You may add landscaping. You may add a pond (and add spawners using BUYDEBUG), although only a Piscator may fish from it. Fences may only be used around the garden, and must be gated as outlined in the garden section. Tomato plants must be placed in their own fenced area for access by all members of the household. A 40x40 lot created especially for this challenge is available on the Exchange: Humble Monastery . It includes equipment for starting and unlockable roles, plus tomatoes and gardening book. If you want to make your own monastery, here are the specifications. Place your sims in any world, on an empty lot at least 40x40. Your lot must always have a chapel, although you may move your chapel around on your lot. Assign the front door of your household to a chapel door. The chapel must be 8 x 8 and contain the furniture below. The chapel may only contain the following items at the start of the challenge. As the game progresses, you may upgrade the furniture/equipment (through shopping Trips), and do other things to improve the chapel, but you must never place any art or statuary in the chapel. One end table with no environment score. On this table, place one Patio Party Light (from the outdoor lighting menu). This represents the higher power. One 18 Disk Stereo System from Albacore Audio. No other stereo system is allowed on the lot. This stereo must always be in working order. If it breaks, it may be fixed by an Artifex or repaired by calling a Repairman. Six Volcano Table Torches (also from the outdoor lighting menu). These represent your higher power working to cure soul sickness among your people. Whenever a monk gets soul sick, place one Torch aside for every day that sim is sick. See Soul Sickness for details. One Community Bench, to accommodate monks resting and studying in the presence of the higher power. Initially, there are not enough beds to go around. Additional beds of basic quality may be added via shopping Trips. Trips are discussed in their own section. One table that seats four, with no environment score. Two chairs with no environment score. Initially, there are not enough chairs to go around. Additional tables and chairs of basic quality may be added via shopping trips. The kitchen must be in its own space, with a door that locks. Sims may not access the kitchen without a Provisioner, Farmer, or Piscator present in the household. Once Provisioner unlocks cooking, any sim may access the kitchen. Quick meals and meals prepared with ingredients you must “buy” from the kitchen are prohibited at all times. If you have no prepared meals available, then everyone eats tomatoes or produce obtained through allowable means that day. One bookshelf with no environment score. You may go on shopping Trips for additional furniture, any Fun=4 TV, decorative items, etc. Initially, there is no shower, and only one toilet. You may only have one toilet on the lot, until additional toilets are unlocked by the Plumber. Broken plumbing may be fixed by a Plumber or repaired by calling a Repairman. Additional bathroom fixtures, such as showers, baths, mirrors, or counters, may be added via shopping Trips, at the lowest quality available. Your lot must have tomato plants in an fenced area accessible to all residents. Any monk may plant, water, or harvest the tomato plant(s). If you plant a new tomato plant once or twice a week, you should always have harvestable tomatoes. I suggest you make a separate fenced area for other vegetables in case you have a Provisioner, but no Farmer. Unless a Farmer is present, only the Provisioner may tend the vegetable garden. You may place two Fern Plant anywhere in your monastery. Once you finish building on your lot on Day One, you may not enter Build Mode again until a Carpenter (AMB) unlocks it. The monastery opens on Sunday. Someone will need to make a quick run to the town to get the following items then reduce your starting household funds to 1000 simoleons. Someone should Call for Services to cancel the newspaper immediately. We don't really want to read about the sad state of the outside world. 65 tomatoes (Each sim gets 15, and you can plant the rest. It takes one plant per monk to sustain them if you have no prepared food.). I go ahead and buy Gladiator Camera, Nectar Maker, and Necteaux a this time, putting them in family inventory for when I get the crew to use them. Many sims come into the monastery with the equipment to do their role, so the indicated equipment should come into the monastery at this time. 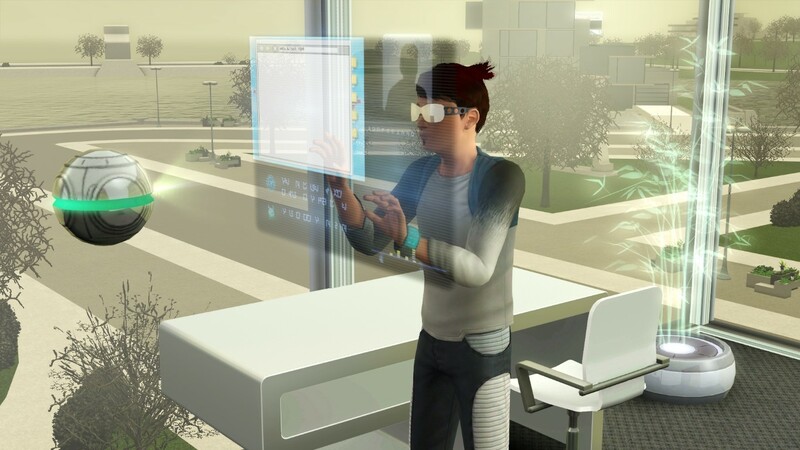 Depending on which roles you have for your starting sims, you may place their equipment and leave the rest in family inventory for when you get a sim that can use the equipment. See the Roles sections for role descriptions. Ready to begin? Here goes! DESCRIPTION: Seeks to address soul sickness by transforming the useless into the useful. Understands the essential nature of electricity. May use the Scraptronic Workbench. May create inventions for use at the monastery. May purchase scrap through the Scraptronic Workbench. May use the miner, sell what it digs up, and explore the hole. May not connect mining tunnels to town locations. May not use the Time Machine. May not detonate, as that action is too traumatic and just causes soul sickness right and left. 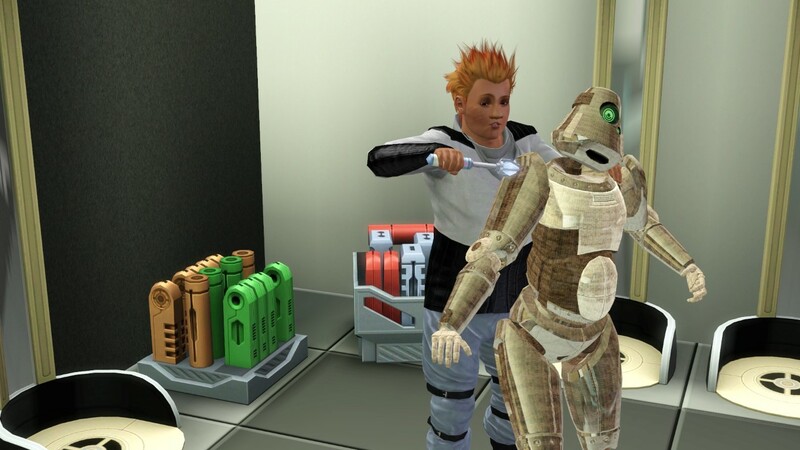 May not build Simbot as your sims are too pitiful to go collecting for rare materials. May not max Handiness unless a Plumber has maxed it first. All residents now have the same abilities as Artifex. Adds cars and Car Parking Space to the shopping list. PREMIUM BONUS at LEVEL 10: May now use the Buy Mode to buy one item a week without going on a Trip. DESCRIPTION: The presence of a skilled musician in the monastery greatly improves the rate at which sims recover from soul sickness. May heal soul sickness as follows: If a sick sim autonomously listens to a Level 4 or higher Bard, they are healed one day! If a Bard gets sick while playing or queued to play, they may enjoy the same healing effects of their music by playing for at least an hour. May not form a band. May not play for tips. Adds musical instruments to the shopping list. All residents now have the same abilities as a Bard. Adds xylophone to the shopping list. Toddler sims may use xylophone. PREMIUM BONUS at LEVEL 10: May recruit one townie of the Bard's choice. This recruitment can be delayed for later or implemented immediately. COMES WITH: Sculpting Station and a Clothing Hamper by Full Load. DESCRIPTION: Uses their inner vision to infuse healthy energy into practical and decorative things. Believes that handmade goods are healthier than store-bought. Believes clean clothes are fundamental to a clean heart. May use the Sculpting Station. May place their sculptures onto the lot or into Family Inventory. The household may use any sculptures created by the Carpenter, without regard to other limits on quality or quantity. May sculpt with any materials. Adds Swashbuckler Washing Machine, Dryer Du Clunk, and Clothing Hamper by Full Load to the shopping list as soon as the Carpenter arrives. All residents now have the same abilities as Carpenter. Adds Sculpting Station to the shopping list. Adds high quality laundry equipment to the shopping list. PREMIUM BONUS at LEVEL 10: May now use the Build Mode to build on your lot. DESCRIPTION: The Farmer communes with the higher power by working with root, sprout, and branch. May garden any plantable item. May sell any harvested produce. May access the kitchen and prepare any meal for which they have ingredients. If a Farmer is present, any sim may access the kitchen to retrieve leftovers from the refrigerator. May read Gardening and Cooking skill books and/or watch gardening/cooking on tv. Grants Provisioners the ability to cook with fruits. May go on Expeditions for seeds/plantables, subject to the rules for Expeditions. May not max the Cooking skill unless previously maxed by a Level 10 Provisioner. May not “buy” from the refrigerator. All residents now have the same abilities as Farmer. PREMIUM BONUS at LEVEL 10: Unlocks Apothecary (requires WA). DESCRIPTION: Inspires and eases soul sickness through the careful and contemplative dabbing of paint on canvas. The presence of a Masterpiece hanging on the walls of the monastery improves healing. Any sim who becomes sick in a room with a Masterpiece on the wall of that area will receive one day off sick time. If you have a big room with areas for different functions, (e.g. living/dining), you need a Masterpiece for each area. Only one Masterpiece placed in an area grants the healing. You may move Masterpieces around if you sense a need for higher levels of protection in an area, however, when a sim gets sick, you must determine their immunity based on what was on the walls at the time of the event that made them sick; no moving Masterpieces in afterward. I found it helpful to put a frame around the Masterpieces, so I could tell which was eligible from among all the paintings on the wall. And, as a reminder, you may not place art on the chapel walls. May skill up in painting. May sell their paintings or place them on the lot or in Family Inventory. All residents now have the same abilities as Illuminator. Adds Easels to the shopping list. Toddler sims may read/be read the painting related skill books: Don't Stay in Lines, Fingerpainting 101, and Handprints. PREMIUM BONUS at LEVEL 10: Unlocks Missionary. DESCRIPTION: The Liturgist performs comprehensive soul-searching in the holosprite's databanks. Empowered with this insight, the presence of a Liturgist deepens the residents' faith. Level 4: At Level 4 in Advanced Techology, a Liturgist can “bless” a Trip. To “bless” a Trip, have the Liturgist talk to the holosprite in the chapel for the duration of the time the Trip takes place. The “blessing” grants the sim(s) on the Trip one free re-roll of Trip Risk upon their return. You may choose which Trip Risk you wish to apply. Also, while the Liturgist is in the chapel talking to the holosprite, they are resistant to contagion. All residents now have the same abilities as Liturgist. Adds holosprite, windcarvers, and jet packs to the shopping list. Adds tube elevators to the shopping list, subject to a Level 10 Carpenter lifting the restriction on Build Mode. PREMIUM BONUS at LEVEL 10: Unlocks Xenobiologist. DESCRIPTION: Underwater creatures gladden the heart of the Piscator. Being outdoors a lot doesn't hurt, either. May fish from home pond. May go on Fishing Expeditions at any hour of the day. See Expeditions for details. May cook dishes with fish, although if Cooking is not unlocked, this means they must learn the first three levels of Cooking from the manual/tv to be able to cook the first meal involving fish: Fish and Chips (level 3 cooking). If a Piscator is present, any sim may access the kitchen to retrieve leftovers from the refrigerator. Grants Provisioner the ability to cook with fish. May read Fishing books and watch fishing on tv. May not cook meals involving ingredients other than fish unless Provisioner (vegetables) or Farmer (any produce) cause other types of produce to be cookable. All residents now have the same abilities as Piscator. Adds fish tanks/bowls to the shopping list. PREMIUM BONUS at LEVEL 10: Unlocks Faith Healer. DESCRIPTION: Improves morale by ensuring a clean, functioning water supply. Assumes the abilities of Artifex and Carpenter if you don't have AMBITIONS. Allows a second toilet on the lot. All residents now have the same abilities as Plumber. Adds plumbing equipment of any quality on the shopping list. Adds block tables to the shopping list. Toddlers/Child sims may now use the block table. PREMIUM BONUS at LEVEL 10: Removes the 2-toilet limit. DESCRIPTION: A healthy soul starts with a healthy body, according to the Porter. Eager to help out, the Porter enjoys lifting and carrying. May skill up athletic using treadmill, jog, tv, etc. Note, however, that leaving the lot to jog or whatever incurs Trip Risk. Level 4: May bring another sim on a shopping Trip to carry back a double portion. So if the Trip involves shopping for a bed, having a Porter bring someone else along can bring home the bed and something else. Refer to Trips for more details. Level 5: If a Level 5 or higher Porter gets sick, they may use a Randomness Test to try to remove one day off their sick time. Level 7: If a Level 7 or higher Porter gets sick, they may use a Randomness Test to try to remove two days off their sick time. If a Level 10 Porter gets sick, they may use a Randomness Test to try to remove three days off their sick time. All residents now have the same abilities as Porter, and may enjoy the same immunities, depending on their Athletic level. Adds athletic equipment of any kind and quality to the shopping list. PREMIUM BONUS at LEVEL 10: May carry back a triple portion from a shopping Trip. Unlocks the Town Gym and Neighborhood Pool as Trip destinations for your sims, subject to Trip Risk. DESCRIPTION: A Provisioner uses vegetables to prepare wholesome food for the well-being of all. If a Provisioner is present, any sim may access the kitchen to retrieve leftovers from the refrigerator. May cook any meal with vegetables only. May grow and tend a vegetable garden. Unless unlocked through game play, set the garden gate so that only the Provisioner may enter the vegetable area of the garden. Tomatoes can be in another area, as any monk may freely tend tomato plants. May not cook meals with fruit, unless unlocked by Farmer. May not cook meals with fish, unless unlocked by a Piscator. May not “buy” meals from the refrigerator. May not sell produce (restricted to Farmer). All residents now have the same abilities as Provisioner. Adds high quality stoves and refrigerators to the shopping list. PREMIUM BONUS at LEVEL 10: Unlocks Veterinarian (requires PETS) and Tincturist (requires LN). DESCRIPTION: Shares insightful ideas through inspirational writings. Strengthens others who read their best works. A monk who carries three Scribe's books with them may be excused from one day of sick time if they get sick while they have the books in their backpack. (Must have books in backpack when the event triggering the sickness occurred. No putting books in afterward! Also, only three books allowed per monk.) See below for careful management of Scribe's written material. May write non-fiction books (about the joys of monastery life, or the enigmatic nature of the higher power, etc.) for publication. Level 4: Scribe may put any Best-Seller they write into the monastery's bookshelf to be checked out by any monk. All other books written by Scribe must be placed in Family Inventory or sold. You may not purchase extra copies of a best-seller; each book must be the only copy. All residents now have the same abilities as Scribe. May now move graves/urns, if you do not have ITF. Adds high quality PCs to the shopping list. Toddlers may now read/be read the Writing skill books: Bluish Eggs, Frank I'm Not, and Oh the Destinations. PREMIUM BONUS at LEVEL 10: Unlocks the Town Library as a Trip destination by your sims, so that you may begin skilling up there. A Library Trip is subject to Trip Risk, but may occur on the same day as a shopping Trip. DESCRIPTION: Studies the stars and imparts wisdom to others. May earn money through the Telescope, finding celestial objects and meteors. If a Secretskeeper finds a meteor, the next person to go on a Trip may bring the meteor back as part of that Trip; it does not have to be a separate Trip. Level 5: Unlocks allowing children into the monastery if you wish. The child/teen may either homeschool (See Mods section about homeschooling) or you may delete the town school. Adds basic quality nursery equipment to the shopping list. All residents now have the same abilities as Secretskeeper. Adds logic equipment of any type and quality to the shopping list. Adds high quality nursery equipment to the shopping list. The following additional EP-specific roles are available once their pre-requisite skills have been unlocked by an earlier sim. DESCRIPTION: Mixes the finest ingredients into healing tonics. May read the Nectar Making skill books. May make nectars using the Nectar Maker. Bottled nectar must be stored in the chapel. Once nectar has aged in the chapel for awhile, it begins to have healing properties. A sim who drinks a Great or better quality nectar may use a Randomness Test to try to negate one day of soul sickness if they get sick while a moodlet from the nectar is active. A sim may drink this nectar after returning from a Trip and JUST BEFORE they roll/draw for Trip Risk! This effect is in addition to the “Had a Nice Nap” moodlet! All residents now have the same abilities as Apothecary. Adds Nectar Maker and Necteaux to the shopping list. DESCRIPTION: The Faith Healer infuses their sense of oneness into mixtures for healing. Potent liquids can ease even the most troubled soul. May sell elixirs and alchemical ingredients. May go on Expedition to harvest wild mushrooms or collect gems/metals. May go on shopping Trip to elixir shop for purpose of buying alchemical ingredients only. May may use or throw any elixir except those that grant Supernatural life states. The Faith Healer may produce life states elixirs, but may not use them until Level 10 Alchemy. Adds Bee Boxes and gem cutter to the shopping list. All residents now have the same abilities as Faith Healer. Adds Alchemy station to the shopping list. PREMIUM BONUS at LEVEL 10: May use elixirs that grant Supernatural life states. DESCRIPTION: The Missionary takes a visual approach to healing soul sickness and travels the world looking for inspiration. May take photos in your home neighborhood; treat this like an Expedition, rather than a Trip. See Expeditions. May sell photographs using the sell box in their inventory, but hang onto the ones worth 1000 or more simoleons. May wander freely about the vacation world, explore tombs, and make purchases of camping supplies and skill/recipe books. May take adventure opportunities and earn Visa levels. May sell items found in tombs. May bring back seeds/plantables from vacation worlds. May gain levels in Athletics but may not max Athletics until maxed by a Porter. May gain levels in Martial Arts, but may not max it until maxed by a Ninja. May not buy treasure just to sell. May not purchase vacation homes. 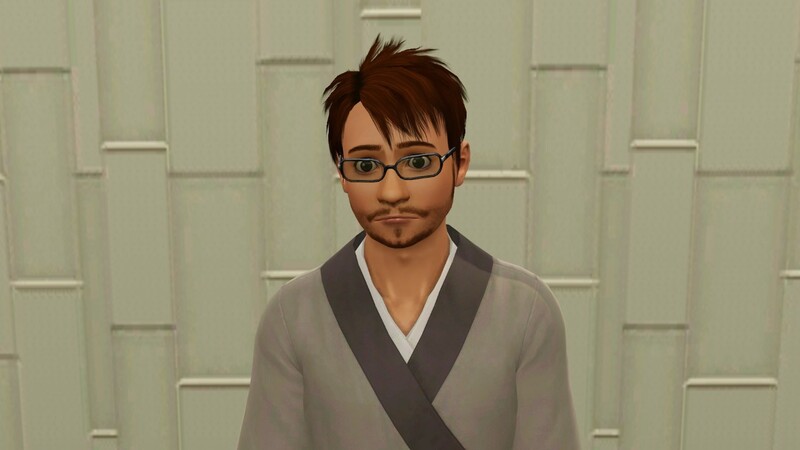 Level 0: For every photo the Missionary takes that is worth 1000 simoleons or more, they may cure one day off any monk's soul sickness. Just hang on to the photos, and sell them when you want to remove the day of sickness. All residents now have the same abilities as Missionary. PREMIUM BONUS at LEVEL 10: A Level 10 Missionary is no longer subject to Trip Risk. DESCRIPTION: The Ninja devotes their simself to overcoming soul sickness through martial training. May break rocks and sell them from inventory. Since practicing Martial Arts also levels Athletics, the Ninja enjoys the same benefits to immunity as the Porter. See Porter. All residents now have the same abilities as Ninja. PREMIUM BONUS at LEVEL 10: A Level 10 Ninja is longer subject to Trip Risk, although they may still experience Random Outbreak. DESCRIPTION: A Tincturist extracts ethereal essences to improve skill retention, mood, and health of monastery residents. Any monk may freely sample the Tincturist's concoctions and gain their benefits. May mix drinks of all kinds. May go to bars to learn drink mixes, subject to Expedition risk. See Expeditions. May not moonlight as a mixologist. Level 8: Begins making Sorrow Annihilators. Once this happens, any sick sim who autonomously drinks a Sorrow Annihilator will get healthier by one day! All residents now have the same abilities as Tincturist. PREMIUM BONUS at LEVEL 10: A Level 10 Tincturist is automatically granted a free day whenever they get sick. COMES WITH: A horse (adopt one using the phone) and an Old Western Box Stall. DESCRIPTION: Choosing stewardship over consumerism, the Veterinarian is dedicated to the care and nurture of the animal kingdom. Working with animals provides the Veterinarian with peace and a sense of harmony with the world. May go on Equestrian Expeditions to ride, train, sell/stud their horse (see Expeditions). May offer horses for sale or stud service. May adopt any stray animal or wild horse. May train pets to hunt or race. May sell minor animals (insects, rodents, birds, etc) through the sell box in their inventory or the pet's inventory. Other monks may provide basic care – feeding treats, grooming, brushing, cleaning hooves, praise/scold, etc., but only the Veterinarian may train (hunt, jump, race) or ride until unlocked at Level 10. After the initial horse, they may not use the phone to adopt an animal. Level 0: Once a Veterinarian arrives at the monastery, you may add any base pet-related item to the shopping list. All residents now have the same abilities as Veterinarian. Adds pet-related items of any quality to the shopping list. PREMIUM BONUS at LEVEL 10: Any monk who rides a horse to their destination will not incur Trip Risk for that Trip. 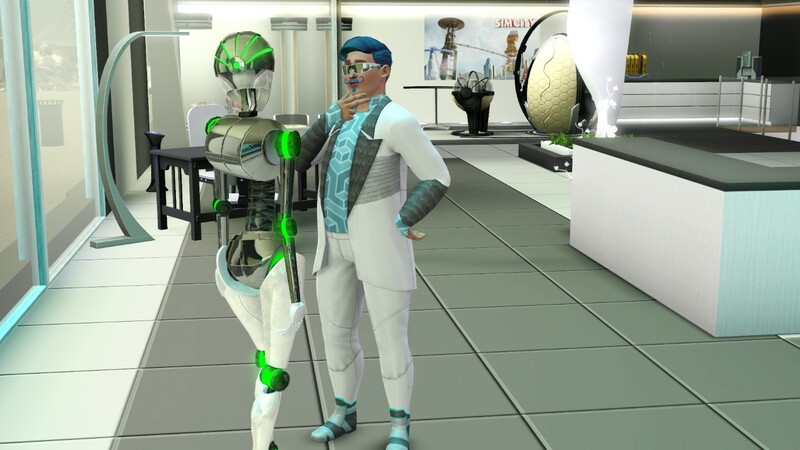 DESCRIPTION: The Xenobiologist studies spiritual growth and transformation by observing the future. May travel to any future. A normal or Utopian future incurs no Trip Risk. May collect nanites and crystal flowers from Oasis Landing. 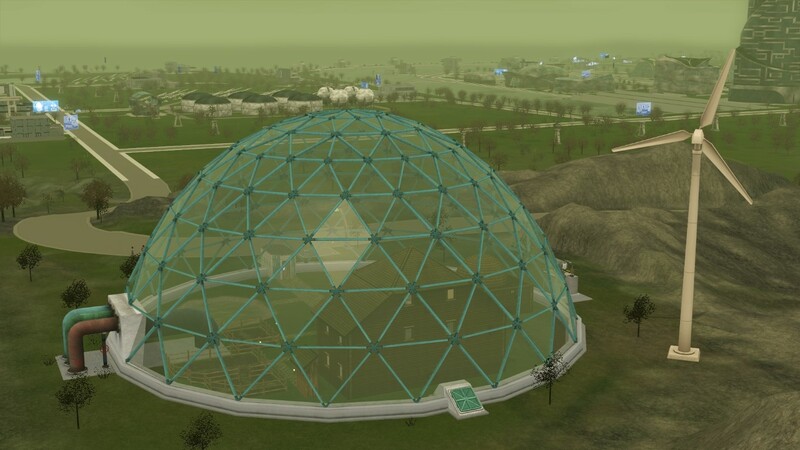 Unless Farming is unlocked, the Xenobiologist must harvest all Crystal components from plants in Oasis Landing. May build and sell Plumbots. May not purchase property in Oasis Landing. All residents now have the same abilities as Xenobiologist. Adds Bot Building Station and Bot Charging Station to the shopping list. PREMIUM BONUS at LEVEL 10: Adds one Plumbot to your household which may learn or use a trait chip for any skill that is already unlocked, plus any non-skill related chips (Friendly, Robonanny, Solar-Powered, etc.) This Plumbot is not subject to Random Outbreak or Trip Risk! ; however, they can only go on Trips if they are randomly selected, just like any other role. Everything you need to know about Soul Sickness. Generally speaking, if a sim is actively soul-sick, you may not issue any direct commands to them. A day of soul sickness ends at 23:59. Whenever a sim gets sick, their first day of sickness ends at 23:59 of that day. Whenever a monk gets soul sick, place one Volcano Table Torch aside for every day that sim is sick. These represent your higher power working to cure soul sickness among your people. Set the "sick" torches near the equipment that monk uses to skill with, so you know who is sick and for how long. So if the Provisioner gets two days of soul sickness, place two Torches in the kitchen somewhere; if the Porter gets one day of soul sickness, one Torch goes by the treadmill, etc. At 23:59 each day, you put one Torch back into the chapel for each sick sim. If a random event adds or subtracts days of sickness, you can keep up with who still has how much sickness by where the Torches are at any moment. IMPORTANT!!!! : If there are not enough Torches in the Chapel to set aside one for each day of sickness (minus the resistance due to “Have a Nice Nap” moodlet, or some other means of decreasing sick days), then that sim DIES! The higher power has only so much energy to devote to curing your overworked sims and if you exceed this limit, your sim pays the consequences. Take care of your sims, put off that Trip, set aside plenty of time for a chapel nap, make sure everyone gets sleep and food, and you should be ok. I use Master Controller to kill them off, but you can kick them out if you want. You may move stuff in or out of a sick sim's personal inventory if you wish. (No, you can't move in those healing items now, they are already sick!). You may also move food into their inventory so that they may autonomously eat. You may have healthy sims interact with sick sims, call them to meals, talk, etc. You may click to promise or remove wishes for a sick sim. You may click to cancel an action that is prohibited, like grabbing a quick meal or using equipment they are not authorized to use. Had A Nice Nap: Any sim may commune with the higher power by napping on the bench in the chapel. If they complete the full nap (2 hours), they earn one day of sick time off if a soul sickness event occurs for the duration of the “Had a Nice Nap” moodlet. (In other words, if an event occurs that would sicken the sim, they get one day off the sick time caused by the event, as long as the moodlet is present when the event occurs.) While you can do this anytime to bolster your monks, it is especially useful in preparing their soul to go on a Trip. Certain conditions have a healing effect, and may prevent or help heal soul sickness. These conditions arise when Trip Risk results in a healing, through Random Outbreak, or through the efforts of the monks according to their role (each role will say if this is the case). You never know when the higher power is going to suddenly heal someone! Your monks are allowed to leave the lot, and doing so falls under two categories: Trips and Expeditions. The Trip provides a way for the monastery to improve living conditions, replace broken items, recruit new residents, and obtain needed resources. The monastery may send someone into town once per day to shop for needed items. They may bring back one book, recipe, musical score, or “buy item” per shopping Trip, or up to 3 edible/cookable/plantable ingredients from the grocery store. Generally, your monastery may only acquire basic, low-quality items until a skilled expert unlocks higher quality. If you're not sure, just buy the cheapest option you have available. When a monk unlocks the ability to “Add something to the shopping list” through skill-building, then that item may now be acquired by planning a shopping Trip for it. A “Trip” includes selecting someone to go, rest and contemplation, the Trip itself, and rolling the Trip Risk afterwards. The sim(s) must be well (not suffering from soul sickness) at the time of the Trip. If it is a shopping Trip, you must randomly draw/roll who is going to go on the Trip. If you draw/roll someone who is currently sick, you must draw again. If you don't like whom you have to send, then you must wait until the next day and plan another Trip. If you draw a Porter, the Porter may go and also draw for another to accompany, at your option. It's like having a free draw. (See notes on Porter.) When drawing for Trip Risk, it is the Porter who is subject to the risk, not the second monk. Shopping Trips may only occur during daylight hours. They cannot start until 06:00 and everyone must be back at the monastery by 18:00. Shopping is limited to once per day, unless an additional shopping Trip occurs due to a random event. Other concerns may take your sims off the lot. This is allowed. The limitation is only for shopping Trips. A shopping Trip is to the (store or bookstore) and back. The sim must actually go, even if the purchase is really going to come from the Buy Mode. The Trip ends when the returning sim(s) enter the front door to the chapel. Once the shopper(s) return, you may enter Buy Mode to “retrieve” any furniture or other items purchased on the Trip and then proceed directly to rolling/drawing for Trip Risk. Expeditions are slightly different from other Trips. A monk may only take an Expedition to assist with their area of study. They can go any time of the day. Because the monk going on Expedition is fulfilling the needs of their soul, they have a low likelihood of Trip Risk. In fact, they may rarely experience Trip Risk! To determine whether an Expedition has resulted in Trip Risk, draw/roll a Randomness Test (see below). If the Test results in success, then there is no Trip Risk! A Failure on the Randomness Test means they must roll/draw for Trip Risk. If this results in them getting sick, they automatically get one day immunity protection for all that soul-searching they did while they were on their Expedition. Any other healing efforts also apply. Your sim gets soul sick due to the internal turmoil caused by going out into the world. They immediately get sick for one day. Healing through skill items or the nap moodlet may apply. Their faith sustained them. Carry on. A Townie* at or near the town library saw your monk while they were out and became so inspired by your example that they wish to join your monastery! Your sim gets soul sick due to the internal turmoil caused by going out into the world. They immediately get sick for two days. Subtract any healing that applies. Your sim was moved to help the plight of the poor. Reduce your family funds by 50 percent. This act of faith encourages others in the monastery, removing one sick day from everyone currently sick. A Townie* at or near the Gym saw your monk while they were out and became so inspired by your example that they wish to join your monastery! Their faith sustained them and sudden providence adds 1000 simoleons to your household funds! Your sim gets soul sick due to the internal turmoil caused by going out into the world. They immediately get sick for three days. Subtract any healing that applies. You come home with an uncontrollable desire to buy something. You must go on a shopping Trip immediately, without stopping for preparation. This new Trip is subject to Trip Risk. Time of day doesn't matter. You realize that person who “bumped” you in passing stole your wallet! You lose 75 percent of the household funds! Contagion! One day of soul sickness for the affected sim, PLUS one day for the next nearest sim. Healing through skill items or the nap moodlet may apply. If the nearest sim is already sick, the outbreak makes them one day sicker. Your sim is about to die of soul sickness! You get a Randomness Test to see if they make it! See Randomness Test. You must have or make room for the new resident first, then center your map on the community lot noted in the text and find the townie nearest the entrance. Use Master Controller (Sim: Intermediate: Add Sim) to add them to your household, or use Edit Town to split them from their old household and add them to yours. You may not keep a Level 10 in the household, if your monastery is full when a townie is recruited via Trip Risk. The challenge is written to encourage the inflow of new residents. However, you are not required to add townies if your monastery is full and there are no level 10's. You get 1600 simoleons every time you add a townie. If they bring more, delete the extra. If they bring nothing, add the moola via a cheat. If removing that townie from their household would leave children/pets in their former house alone, you can either include the children/pets in the transfer to your household if you have unlocked them, or go back to the community lot and select a different sim. If the townie nearest the entrance is a child, remember that you may not bring a child sim in unless children are unlocked (level 5 Secretskeeper). Even if you are eligible to have children in the monastery, you may still pass over a child for the next nearest adult. You are not required to raise children in your monastery. You may pass over an elder if you must, although they typically have better skills. However, the higher power realizes that the elderly are greatly venerated in their own homes and will leave it up to you to decide whether to uproot them. 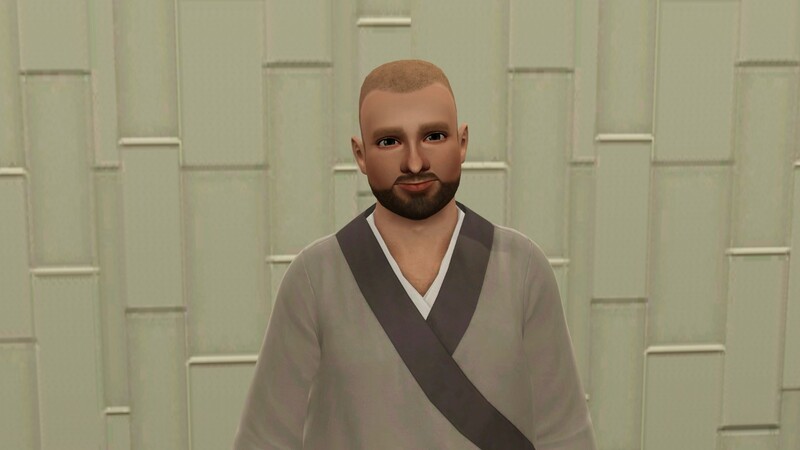 You may NOT otherwise “evaluate” sims for their suitability to join the monastery! No checking their traits! No waiting to see if a “better” candidate shows up! Whoever is closest to the door is the one being called by the higher power; this is not up to you. If you can't find a townie anywhere near the entrance to that community building, you may wait and watch to see who shows up next, or circle outward until you find someone. You may keep and use/sell any items in their inventory. They should quit their job on their way to your lot. If you haven't yet brought in the first harvest of tomatoes, and you have no other food, your new monk may stop at the grocery on the way to your lot to buy 15 tomatoes. These stops do not incur Trip Risk. Sims that enter the monastery already skilled in an area may not benefit of that skill unless it is already unlocked. However, if they are called to serve in a role that involves that skill, then they have a head start! Start them out by dancing in the chapel to praise the higher power's wisdom in calling that sim to that role! After that, they may continue in their role, and with the benefits of their higher status already available. Sometimes, stuff just happens. It's life: scary, unpredictable. It's enough to make a soul sick, isn't it? Even within the calming environs of the monastery, there is risk, and this risk is called "Random Outbreak". Random Outbreaks (not to be confused with “Randomness Test”, which has its own section) occur due to the following events. Shattering the Peace: Any time a phone rings, the sim whose phone it is must roll/draw for a Random Outbreak. Debt and Crime: if the repo man or a robber come to your monastery, you must roll/draw for a Random Outbreak for the monk nearest the first item taken. If the robber/repo doesn't take anything, you do not draw. Undead Uprising: If a zombie appears on your home lot, you must roll/draw for a Random Outbreak for the sim nearest the zombie spawn point. You only need to do this for the first zombie that appears during a given Full Moon. Bad Moodlets: If a sim experiences a negative moodlet of -20 or worse, you must roll/draw for a Random Outbreak for them. (Example: Dirty Surroundings won't trigger the Random Outbreak, but Filthy Surroundings will.) See General Rules for more details on Bad Moodlets. If they are already sick, they do not draw. When a Random Outbreak occurs, you may not queue up that sim's actions before you roll! If they have queued actions, you must leave those. Their faith sustains them. Carry on. They struggle to find meaning. One day of soul sickness, to begin immediately. Healing through skill items or the nap moodlet may apply. They feel sad and listless. They must stop what they are doing immediately and go dance to the stereo in the chapel. After that they will feel better and can carry on. They are troubled by sorrow. Two days of soul sickness, to begin immediately. Healing through skill items or the nap moodlet may apply. Your higher power answers your supplication and grants one day off the sick time for the sick sim of your choice. To introduce another level of Randomness, the challenge sometimes requires a Randomness Test. The higher power has the ability to negate negative events by allowing a Randomness check. Remember how you have six Torches in the chapel, and when someone gets sick, you remove one for every day of the sickness? The number of Torches left in the chapel when the game calls for a Randomness Test determines the chance of risk when bad stuff happens. The more Torches, the higher likelihood of a successful outcome. Count the Torches in the chapel (representing the unused higher power), and roll/draw from that many. For instance, say your higher power is currently healing two days of sick time for another sim, so you should have 4 Torches in the chapel. Therefore, roll/draw a random number between 1-4 (a 75 percent chance of success). If you roll/draw a “1”, you fail, and the you go on to play out the consequences. If you roll any other number, you successfully dodged all that uncertainty that time. Failed. You failed to achieve what you were hoping for. Succeeded. You succeeded in what you were hoping for. Below are general rules of play that didn't fit neatly into the above sections. Accept any Wish/Opportunity they want; however, any Trip the monk takes off the lot to fulfill a Wish/Opportunity counts as a Trip. It must be planned as a Trip, and is subject to Trip Risk. You may still shop on that day. Eat tomatoes, meals prepared by Provisioner/Farmer/Piscator, or produce from allowable gardening activities. Add any skill book to the monastery's bookshelf via shopping Trip, regardless of who lives/has lived in the monastery. This includes literature, recipes, toddler books, and musical scores. In this way, you may prepare for future roles. Use the the Family Inventory section of Buy mode to move stuff around as much as you want, but you can't Build until Build Mode is unlocked, and you can only use Buy Mode as authorized in the challenge. Play the Lotto; it counts as your shopping Trip for that day and is subject to Trip Risk. Bake and use Ambrosia, provided you have/had a Farmer to grow the Life Plant, a Piscator to reel in the Deathfish, and a Level 10 Provisioner to bake the item. Buying the recipe counts as a shopping Trip, and is subject to Trip Risk. Hire/purchase service people, if you have the funds. Purchases associated with this rule require a shopping Trip and are subject to Trip Risk. Just a note of caution: You might want to wait until your initial household members have left the monastery before purchasing a Bonehilda. Don't say I didn't warn you. Choose the Nap interaction unless they are in the chapel. Unlock more than one skill. This rule does not prevent a monk from learning or maxing a previously unlocked skill. They just can't personally unlock more than one. Once a sim reaches Level 10 in their skill, they may stay in residence until a townie needs their spot to move in (when the household is full) or, if you want them gone, you can kick them out. Keep a Level 10 in the household, if your monastery is full when a townie is recruited via Trip Risk. The challenge is written to encourage the inflow of new residents. When a new sim joins the household, roll/draw for the sim's role-specific skill. Most “arrive” with some item to skill with. You get one “free” trip to buy mode/family inventory to obtain the necessary equipment that is supposed to come with that person. Children/Teens may not attend regular school. You may either homeschool them (see Mods) or delete the town school. (If you don't have a Scribe, you may still use the Easy Machine from Fred's PC Hut for the child to download homework on.) When I tested the homeschool mod, my teen had to go to the City Hall to turn in homework. I counted this as an Expeditionn. If you do not have a Plumber/Artifex, then broken plumbing/electrical may be repaired by calling a Repairman. If you do not have a Provisioner/Farmer/Piscator, you will not be able to access the kitchen. 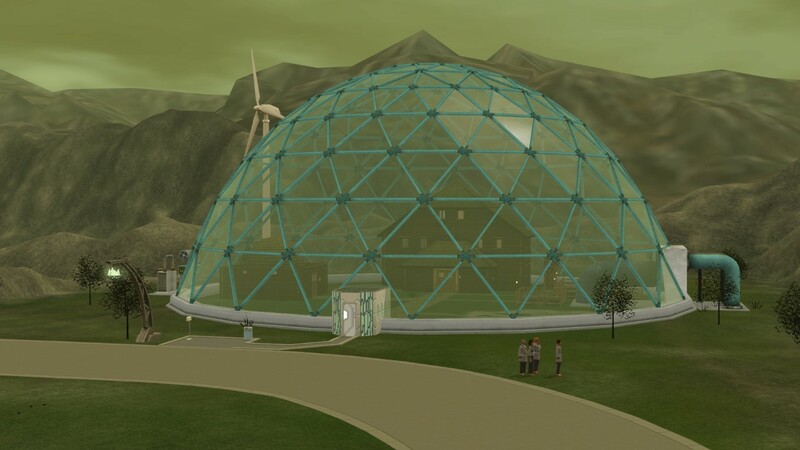 Your sims will rely on the bounty granted by the higher power through tomato plants elsewhere on the lot. Therefore, your lot must have tomato plants in an fenced area accessible to the whole household. If you plant a new tomato plant for every monk once a week, plus an extra, you should always have enough harvestable tomatoes. Because tomato plants sometimes require weeding, you may allow sims to learn a bit of gardening through the manual/tv; however, no monk may max gardening unless a Farmer has maxed it first. If a monk dies before reaching Level 10 in their skill, either through soul sickness or some random fatal event like fire or electrocution, you must put their role back in the hat to be drawn again. However, if you get the Oh, My Ghost opportunity chain, you may go ahead and work the opportunity, subject to the usual rules for Trip Risk. The ghost then goes back to the role they had when mortal. If a sim dies on your property, you must leave the grave/urn where it falls upon their death, unless you have a fully trained Liturgist. Or, I suppose, if you are working the Oh, My Ghost opportunity chain, since you have to have the darn thing to take to the Lab! Birthdays: There's really not any reason to age anyone up early, but if you want to use a Birthday Cake, you may. Treat it like any other shopping Trip. How to subtract healing. On a case-by-case basis, subtract the healing effects for each monk who gets sick. Example 1: a monk may become contagious, causing one day of sickness for them and one other. The contagious monk may have the nap moodlet, but the other has nothing to heal them. In this case, the monk who had the nap moodlet would not get sick, but the other would. Example 2: Your monk is affected by Random Outbreak and rolls two days of sickness. They had no recent nap, but are in a room with a Masterpiece on the wall. This relieves their soul by one day, so they are only sick for one day. Healing effects occur from nap moodlet, and/or many skill-related items or actions. Each monk brings healing to the others in different ways. Each role-specific healing is described in the Roles section of this challenge. Regarding Random Outbreak due to Bad Moodlet: You need to roll Random Outbreak once per occurrence of the moodlet. Generally, this applies to all preventable moodlets, but some moodlets are not preventable. I had a situation where the townie who joined my monastery as Piscator had the Hates the Outdoors trait, causing a permanent -20 moodlet just for doing his job. I rolled for this Random Outbreak once at the start of his work as a Piscator, then ignored it from then on, since I couldn't get the guy to fish indoors. Also, if someone gets a Bad Moodlet while sick and they get well while the moodlet is still active, you do not need to roll for Random Outbreak since you were unable to take steps to prevent the Bad Moodlet during their illness. Collect those Certificates! When your monks level up, they leave a legacy of healing behind! TWO SKILL: Once you have any two sims reach the highest level of their role, you may begin to purchase higher quality furniture on shopping Trips. For example, instead of just a Energy=4 bed, you might go for a higher quality bed. Plumbing, Laundry, Exercise, and Electronics purchases are still restricted to their cheapest option until unlocked through the challenge rules. SIX SKILL: Once you have six sims reach the highest level of their role, you may begin to roll/draw Trip Risk twice every time they return from a Trip. You may select the Trip Risk of your choice from the two rolls. This doubles your chances of a good outcome! EIGHT SKILL: Once you have eight sims reach the highest level of their skill, you are no longer subject to Random Outbreak! In addition to these bonuses, there are a number of Bonuses built into the challenge which will help you to achieve the challenge goal. These are some rules that I toyed with but discarded as being too challenging. Are you up for them? Use a “hands-off” approach – let your sims clean their own dishes and pick up their own laundry, etc. Elect to keep Seasons on by setting Seasons to Summer only in the Options menu (28 days of Summer, and zero days for the other seasons). Every time a sim gets the flu/allergies, they must roll/draw for Random Outbreak, unless they already have soul sickness, in which case they die. It was just too much for your poor sim to handle. If you choose to repair by calling a Repairman, the person who broke the item must roll for Random Outbreak. The rules allow you to purchase role-specific equipment on the first day of the challenge if you want, but for an added challenge, you can try to add the equipment solely using shopping Trips. If your household does not have the necessary funds to purchase the item(s) right away, you would then have to wait until the money becomes available, and of course, the Trip is subject to Trip Risk. Do not make a distinction between Trip Risk and Expeditions. Every time a monk leaves the lot, they must roll for Trip Risk upon their return. #2 2nd Dec 2015 at 6:05 AM Last edited by NonSequitorian : 2nd Dec 2015 at 7:33 AM. 12/01/2015 Added info buttons to make challenge rules easier to navigate. 12/02/2015 Fixed discrepancy in contagion rules. #3 9th Sep 2017 at 4:10 PM Last edited by Dead Guest : 9th Sep 2017 at 5:42 PM. However, I'm a bit confused on a couple of things. Can a Provisioner plant vegetables other than tomatoes or do I need to have a Farmer for that? Also, if a soul sick sim gets a bad moodlet because it forgot to eat or something, do I roll for Random outbreak again on top of the soul sickness? Sorry for the very late reply. Have switched computers. A Provisioner may plant, harvest, and cook any vegetable. Tomatoes are also plantable and harvestable by any sim, so you may place tomato plants in a common area. The rest of the plants are off limits for other sims, except farmers. A farmer can plant and harvest any plant, including fruits. As for soul sickness, you do need to roll for random outbreak if they get a bad moodlet even while sick. However, you only need to roll once per bad moodlet. So if they get well, you don't have to automatically roll again. More info is found in the general rules section. This is awesome! Really original. I can't wait to try it out This definitely deserves more acknowledgement. #6 16th Jan 2019 at 11:24 PM Last edited by MiaAngelina : 21st Jan 2019 at 11:36 PM. I decided to play this challenge in Dystopian Future instead. Because simkind really hit the rock bottom there, so I guess the Soul Sickness is what followed. I built their monastery under a large eco-dome to isolate them from the horrible world outside, and also to keep the bad weather (and hopefully meteors) off because I'm playing with Seasons. And I decided to have them live without electricity and other modern technology as it was what caused the society's downfall in the first place. So they're returning to the old ways (very old ways, hehe). Short bio: Mitchel was the one who heard the Watcher's call first and used all his money to build the monastery for the soulsick. Short bio: Nina was the first person to join Mitchel's effort. She vowed to forsake all bodily pleasures in search for inner peace and healing of her soul. Short bio: Terrence was always the odd one. It was easier for him to work with plumbots rather than people. When he heard rummors of the Monastery being built, he felt compelled to leave his underpaid job and seek healing for his tormented soul instead. Short bio: Eddie's hectic job had been gnawing on his sanity for a long time. Evil boss, insane schedules and constant overtimes drove him to the very edge of desperation. When he heard the Watcher's call, he decided to abandon everything and join the monastery. I will keep you updated on my game. I hope it will go well. I'm really looking forward to start playing. Week 1: So the first week has passed. No one died so far, though I had a few close calls. I didn't get any new sims, had a ton of outbreaks and right now all 4 sims in the monastery are sick. My Farmer is level 7, Provisioner is level 5, Plumber and Piscator are level 3. It's way harder than I expected! Anyways I'm having a ton of fun! Week 2: This week was literally awful. I kept rolling a lot of sick days and contagions and random outbreaks kept happening in most inconvenient times. I also went a little overboard with my garden so my other sims kept tending whatever parts of it they were allowed instead of skilling their stuff. Mitchel, the Provisioner died of soul sickness midweek. He was level 5, which was my second highest at the moment. No luck in enrolling new sims. My Farmer is now level 9, Plumber and Piscator level 5. I never actually had anyone die of a random roll. Although they had to take lots of naps lol!